Molecular understanding of the mechanism of excitation-contraction (EC) coupling in skeletal muscle has been made possible by cultured myotube models lacking specific dihydropyridine receptor (DHPR) subunits and ryanodine receptor type 1 (RyR1) isoforms. Transient expression of missing cDNAs in mutant myotubes leads to a rapid recovery, within days, of various Ca2+ current and EC coupling phenotypes. These myotube models have thus permitted structure-function analysis of EC coupling domains present in the DHPR controlling the opening of RyR1. The purpose of this brief review is to highlight advances made by this laboratory towards understanding the contribution of domains present in a1S and b1a subunits of the skeletal DHPR to EC coupling signaling. Our main contention is that domains of the a1S II-III loop are necessary but not sufficient to recapitulate skeletal-type EC coupling. Rather, the structural unit that controls the EC coupling signal appears to be the a1S/b1a pair. Skeletal muscle cells respond to membrane action potentials with an elevation in cytosolic Ca2+ that develops instantaneously and is a graded function of voltage. The mechanism that couples membrane excitation to cytosolic Ca2+ increase is made possible by a close interaction between the DHPR L-type Ca2+ channel and RyR1. Close proximity between the DHPR and RyR complexes occurs at specialized junctions established between the transverse tubular and sarcoplasmic reticulum (SR) membranes (Franzini-Armstrong and Protasi, 1997; see also Franzini-Armstrong, this issue). At these junctions, movement of electrical charges in the skeletal DHPR triggers the opening of the RyR1 channel. However, the molecular details of this mechanism, including which DHPR subunits directly contribute to the transmission of the molecular signal to RyR1, are, for the most part, unknown. In molecular terms, the skeletal DHPR is a ~430 kDa heteropentamer composed of a1S, b1a, 2-d1, and g1 subunits. The DHPR a1 subunit belongs to the superfamily of voltage-gated channel proteins with four internal repeats. Electrical charges in the S4 segments in each repeat move outward in response to membrane depolarization, and this movement is coupled to the opening of both the L-type and RyR1 channels. b subunits are ~65 kDa proteins that bind strongly to the cytosolic loop between repeats I and II of a1 via a conserved ~30-residue b interaction domain or BID (Pragnell et al., 1994; De Waard et al., 1994; Fig. 1). b subunits modulate the kinetics of activation and inactivation of the Ca2+ current (Qin et al., 1996; Wei et al., 2000; Berrou et al., 2001) and strengthen the coupling between S4 charge movements and pore opening (Neely et al., 1993; Olcese et al., 1996; Kamp et al., 1996). The molecular structure and function of the a2-d1 and g1 subunits of the skeletal DHPR are far less defined (Gurnett et al., 1996; Ahern et al., 2001a; Arikkath et al., 2003). Figure 1. Conserved residues in the alpha interaction domain (AID) of the Ca2+ channel a1 pore subunit and the beta interaction domain (BID) of the associated b subunit critical for a1/b binding and Ca2+ current expression (from De Waard et al., 1996). b subunits consist of two separate blocks of conserved residues (yellow) flanked by divergent sequences (red) in the linker region connecting the conserved domains (D3), amino terminus (D1), and carboxyl terminus (D5) regions (see Perez-Reyez and Schneider, 1994 for sequence line-ups). Subunit arrangement of the skeletal DHPR according to cryo electron microscopy shows that the b subunit is located to the side of the pore subunit facing the cytoplasm (from Wolf et al., 2003). Studies in dysgenic myotubes lacking a functional a1S protein conducted a decade or more ago (Tanabe et al., 1988, 1990; Garcia et al., 1994) led to the widespread assumption that the a1S II-III loop may be directly responsible for opening RyR1. This view needs to now be challenged for two fundamental reasons. In a strict sense, the observations in dysgenic myotubes cannot exclude the participation of other DHPR subunits because non-pore subunits of the DHPR are constitutively expressed in the dysgenic myotube (Arikkath et al., 2003). Hence, if EC coupling domains were to be present in other subunits of the skeletal DHPR, they would have escaped detection in the dysgenic myotube by virtue of being constitutively present. Moreover, transient transfection of a1S in dysgenic myotubes restores Ca2+ currents, charge movements and Ca2+ transients with entirely normal characteristics (Ahern et al., 2001b,c,d, (2003)). Hence, reassembly of native DHPRs does occur within the window of expression utilized for functional reconstitution studies, typically 3-5 days post-cDNA transfection. Second, the availability of gene knock-out (KO) myotubes generated by gene targeting techniques in mice has permitted molecular studies of DHPR b subunits that parallel those of a1 subunits in dysgenic myotubes. What is most surprising about the b subunit studies (Beurg et al., 1997, 1999a,b; Ahern et al., 2003; Sheridan et al., 2003a,b) is that the phenotypes produced by molecular manipulations of b subunits in b1 KO myotybes are strikingly similar to those described earlier by molecular manipulations of a1S subunits in dysgenic a1S-null myotubes. Such phenotypic parallels (described below) suggest to us that the DHPR b subunit, much like the a1S pore subunit, plays a key role in signal transmission to RyR1. Tanabe et al. (1988) utilized the a1S-null dysgenic myotube to show that the a1S pore subunit was essential for EC coupling signaling. In the dysgenic myotube, a base deletion leads to truncation and degradation of a1S and loss of voltage-activated Ca2+ transients. Transfection of cultured dysgenic myotubes with a1S cDNA leads to de novo synthesis of a1S subunits (Ahern et al., 2001b,d), concentration of the expressed DHPR in EC coupling junctions (Takekura et al., 1994), and recovery of skeletal-type EC coupling (Garcia et al., 1994). This expression system permitted studies in which the missing a1S Ca2+ pore isoform was replaced by a1C, the cardiac/brain pore variant (Tanabe et al., 1990). The Ca2+ fluorescence vs. voltage curve expressed by a1C in dysgenic myotubes had a maximum at ~+30 mV followed by a continuous decrease at more positive potentials. The biphasic nature of this relationship, along with a dependence of Ca2+ transients on external Ca2+, showed that Ca2+ dependent EC coupling could be implemented in skeletal myotubes by a hybrid DHPR composed of a cardiac pore subunit and the non-pore subunits expressed endogenously in the dysgenic myotube. The expression of chimeras of a1S and a1C were later used to demonstrate that a domain within the cytosolic loop linking repeats II and III of a1S, the 720-765 region, harbored a unique signal essential for skeletal,-type EC coupling (Nakai et al., 1998). Gene targeting techniques have increased substantially the number of myotube models that can be used as expression platforms for EC coupling studies. Gregg et al. (1996) described a knockout (KO) of the mouse b1 gene, encoding DHPR b isoforms expressed in skeletal muscle (b1a) and brain (b1b, b1c) (Powers et al., 1992). The b1 KO mutation, like the dysgenic mutation, is perinatally lethal due to the absence of EC coupling in the skeletal musculature. b1 KO myotubes fail to contract in response to electrical stimulation despite the presence of normal action potentials, Ca2+ storage capacity, and caffeine-sensitive Ca2+ release. However, b1 KO cells lack L-type Ca2+ current, and depolarization does not produce Ca2+ transients (Gregg et al., 1996; Strube et al., 1996, 1998). Expression of the skeletal muscle b1a isoform in cultured b1 KO myotubes resulted in the recovery of the wild-type L-type Ca2+ current density, the intramembrane charge movement density, and the amplitude and voltage dependence of Ca2+ transients (Beurg et al., 1997). In contrast, expression of the cardiac/brain b1a variant recovered L-type Ca2+ currents, but the amplitude of depolarization activated Ca2+ transients was depressed drastically. Since the interaction between the DHPR a1 and b subunits is essential for cell surface expression (Chien et al., 1995; Bichet et al., 2000), the loss of EC coupling in the b1 KO myotube could be exclusively due to the loss of DHPR voltage sensors from the cell surface. Alternatively, domains of the DHPR b1a subunit, similar to elements present in the a1S subunit, might be directly involved in activation of RyR1 channels. To examine the role of DHPR b1a in skeletal-type EC coupling, we chimerized b1a and the cardiac/brain b2a variant and mapped the domain(s) required for functional recovery of skeletal-type EC coupling in cultured b1 KO myotubes (Beurg et al., 1999a,b; Sheridan et al., (2003a). DHPR b subunits share two conserved central regions amounting to more than half of the total peptide sequence (domains D2 and D4), a non-conserved linker between the two conserved domains (D3), a nonconserved amino terminus (D1), and a non-conserved carboxyl terminus (D5) (Pérez-Reyes and Schneider, 1994; Fig. 1). We tested the participation of D1, D3, and D5 of b1a in the recovery of Ca2+ conductance, charge movements, and EC coupling in b1 KO skeletal myotubes (Beurg et al., 1999b: Sheridan et al., 2003a). Deletion of the D5 region of b1a (470-524) drastically reduced the amplitude of voltage-evoked Ca2+ transients without affecting the density of DHPR charge movements. On the basis of this result, we have implicated the D5 region of b1a specifically in skeletal-type EC coupling (Sheridan et al., 2003a). The identification of D5 was also important because it showed that domains of b1a that participate in EC coupling differ from the BID domain, present in D4. Hence it is clear that in the b subunit, the trafficking function controlled by the BID domain (Chien et al., 1995; Bichet et al., 2000) and the EC coupling function controlled by D5 have entirely different molecular underpinnings. The a1S II-III loop, under the influence of membrane depolarization, has been suggested to trigger the release of Ca2+ from the SR (Tanabe et al., 1990; Garcia et al., 1994). The II-III loop would thus function as a surrogate "gating particle," which after acquiring the correct conformation becomes a catalyst for the energetically unfavorable opening of the RyR1 channel. Such a view represents a molecular version of the mechanical plunger model suggested by Chandler et al. (1976). A prediction of this model is that the II-III loop must contain molecular motifs essential for activation of the RyR1 channel. A search for different regions of the II-III loop that affect RyR1 channel activity was conducted using recombinant and synthetic peptides covering the entire II-III loop peptide sequence (Lu et al., 1994; El-Hayek et al., 1995; O'Reilly and Ronjat, 1999; Dulhunty et al., 1999; Gurrola et al., 1999; Casarotto et al., 2000). The strongest stimulation of RyR1 channels in vitro was produced by a synthetic peptide corresponding to residues a1S 671-690. A second peptide, 724-760, had low stimulatory activity but inhibited the stimulatory activity of the 671-690 peptide when both synthetic peptides were presented to RyR1-containing skeletal SR vesicles (El-Hayek et al., 1995). These biochemical studies suggest that the 671-690 region of the II-III loop could be the structural element of the II-III loop that triggers EC coupling in the muscle cell (El-Hayek et al., 1998). A second region of the II-III loop critical for EC coupling was identified in dysgenic myotubes by functional expression of chimeric cDNAs for DHPR pore subunits (Nakai et al., 1998). This study showed that a chimera consisting of a cardiac a1C subunit with a1S 720-765 replacing the homologous cardiac region expressed voltage-evoked Ca2+ transients of near-normal amplitude. The narrower a1S 725-742 region recovered a slightly lower than normal Ca2+ transient. Furthermore, the Ca2+ transients in each case persisted in the presence of Ca2+ channel blockers, indicating recovery of skeletal-type EC coupling by the chimeras. Thus, the two screening strategies, namely peptide analysis in vitro (El-Hayek et al., 1995) and chimera analysis in situ (Nakai et al., 1998), arrived at different conclusions regarding the regions of the II-III loop essential for EC coupling function. Is the a1S II-III loop necessary and sufficient for triggering EC coupling? This question was addressed by Ahern et al. (2001c) using a deletion strategy. Residues 671-690 and 720-765 are the only two regions of the II-III loop that have been reported to screen positively for EC coupling-related functions, albeit by different techniques. We thus investigated if voltage-evoked Ca2+ transients were expressed when both regions were removed from the II-III loop. Surprisingly, D671-690/D720-765 expressed Ca2+ transients that increased with depolarization and saturated at a maximum amplitude ~20% of control (Fig. 2). Analysis of the voltage-dependence of the Ca2+ transient showed that neither the midpoint potential nor the steepness of the fluorescence vs. voltage relationship was affected by this double deletion. These results provide a clear indication that the skeletal DHPR has a latent EC coupling activity that is unmasked by simultaneous removal of residues 671-690 and 720-765. In molecular terms, the 720-765 region could be a conformation-sensitive region of the II-III loop stabilized by strong residue-residue interactions with other regions of the II-III loop. Thus, the loss of EC coupling produced by removal of residues 720-765 could be the result of a conformation change which is partially reverted by a second conformational change in the II-III loop produced by removal of residues 671-690. Figure 2. Ca2+ transients expressed by a1S II-III loop deletions in dysgenic myotubes (from Ahern et al., 2001c). The insets show confocal line-scan images of fluo-4 fluorescence in response to a 50-ms depolarization to +90 mV from a holding potential of -40 mV. The line-scan duration (x-axis) was 2.05 seconds and the cell dimension (y-axis) varied with myotube. In some panels, a second line-scan shows a Ca2+ transient after perfusion with external solution containing 10 mM caffeine. a1S lacking the two identified II-III loop domains involved in EC coupling (D671-691/D720-765) recovered a significant fraction of the Ca2+ fluorescence signal. Controls utilizing pore mutations that rendered a1S unable to conduct Ca2+ showed that the recovered EC coupling was strictly skeletal-type. The mechanism by which EC coupling is eliminated by removal of the a1S 720-765 region and recovered by removal of 720-765 and 671-690 at the same time is reminiscent of the electrostatic interactions that hold the voltage sensor of the Shaker K+ channel in a functional state (Papazian et al., 1995). 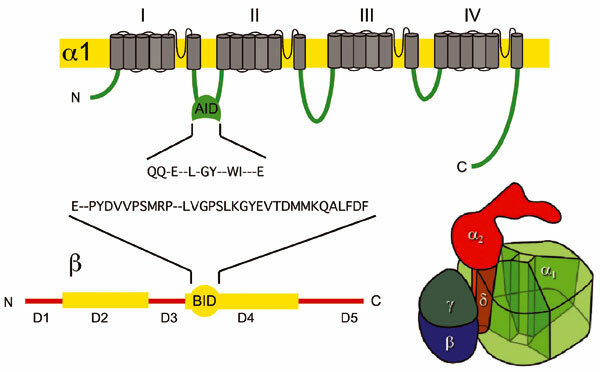 This study showed that some charge neutralization mutations in the S4 transmembrane segment block protein folding. In these cases, channel function can be rescued by a second charge neutralization in S2 or S3. The functional rescue by double mutations suggested that S4 forms a strong network of local electrostatic charges with other transmembrane domains. The observation in the Shaker K+ channel may be directly applicable to the II-III loop, which contains several loci of positive and negative charges within the 671-690 and 720-765 regions and also outside these two regions. A study of charge-charge interactions in the II-III loop by mutagenesis and functional expression is clearly required to provide an explanation consistent with all results. A clear implication of the work of Ahern et al. (2001c) is that the 720-765 region of a1S, instead of a signaling domain, could be a conformation-sensitive "permissive" region controlling protein folding. Disruption of proper protein folding by deletion of residues in this region could impair EC coupling signals generated elsewhere in the DHPR. Alternatively, a1S 720-765 may be one of several regions involved in bi-directional signaling between the DHPR and RyR1. The latter explanation is highly attractive since it also implies that different DHPR-RyR1 coupling domains could trigger SR Ca2+ release perhaps independently of each other. Regardless of the final explanation, the deletion experiments leave no doubt that the a1S II-III loop, although necessary, is not sufficient for triggering EC coupling. Therefore other regions of the DHPR must participate directly in opening RyR1. Are there EC coupling signals generated elsewhere in the DHPR, including in the b1a subunit, that could account for EC coupling in the absence of a1S II-III loop domains? Studies in b1 KO myotubes by Sheridan et al. (2003a) showed that serial truncation of the carboxyl terminus of DHPR b1a modifies EC coupling, transforming it from a process controlled by voltage to a much weaker coupling process controlled by the Ca2+ current. This observation is significant since prior to this work only exchanges of a1C for a1S were known to produce Ca2+ dependent EC coupling in skeletal myotubes. Hence, manipulations of a1S and b1a subunits each independently produced similar outcomes. As a function of carboxyl terminus truncation length (Fig. 3), there was an overall decrease in the amplitude of Ca2+ transients with evident changes in the shape of the Ca2+ fluorescence vs. voltage relationship and the kinetics of the Ca2+ transient. For the most severe truncations, we also observed a dependence of Ca2+ transients on external Ca2+. These observations are consistent with the emergence of Ca2+ dependent EC coupling, whereby Ca2+ entering the cell via the DHPR induces SR Ca2+ release, presumably by Ca2+ dependent activation of RyR1 and possibly RyR3. We have speculated that a Ca2+ dependent mechanism of EC coupling in a skeletal myotube could originate by weakening of the physical docking between the DHPR and RyR1. Physical docking occurs between DHPR tetrads and every other tetrameric RyR1 complex, and is essential for normal transmission of the voltage signal (Franzini-Armstrong and Protasi, 1997). A strongly-docked system with a b subunit that has an intact carboxyl terminus could be essential for translating voltage changes in the DHPR into a signal recognized by RyR1. A weakly-docked system imposed by the presence of a severely-truncated b subunit could permit the Ca2+ current to intervene as EC coupling signaling as long as the DHPR and RyR1 complexes remain co-localized. It is also possible that the partial elimination of the carboxyl terminus of b somehow leads to an increase in the Ca2+ sensitivity of RyR1 (i.e., increased exposure of Ca2+ activation sites in RyR1) and excessive Ca2+ feedback on RyR1. Interestingly, spontaneous Ca2+ sparks in b1 KO myotubes were found to be significantly wider and longer in duration than their counterparts in normal or dysgenic (a1S null) myotubes (Conklin et al., 1999). Thus, the properties of clusters of RyR1 channels can be modified by the absence of the b subunit. Distinguishing between these two possibilities, elucidating the molecular mechanisms underlying the switch from voltage to Ca2+ dependent EC coupling, and investigating the way in which Ca2+ and voltage signals might interact to produce either sigmoidal or bellshaped Ca2+ transient vs. voltage relationships are all areas that deserve close scrutiny in future experiments. The systematic truncation approach provided clues on at least one structural motif present in the D5 region of b1a potentially responsible for the changes in EC coupling. Ca2+ dependent EC coupling was clearly noticeable in the D60 and D29 constructs and much less in D21 (Fig. 3). This could be inferred from the exaggerated curvature of the fluorescence vs. voltage plots and by the dependence of the Ca2+ transients generated by these variants on external Ca2+ (Sheridan et al., 2003a). Inspection of the D5 region indicates that the last 17 to 38 residues of the b1a tail contain a hydrophobic "quasi" heptad repeat, namely L478(n)-V(n+7)-V(n+14)-L(n+22)-L(n+28), present in D21 but almost entirely removed in D29. Heptad repeats are known to be important in protein-protein interactions responsible for gating (McCormack et al., 1991; García et al., 1997). 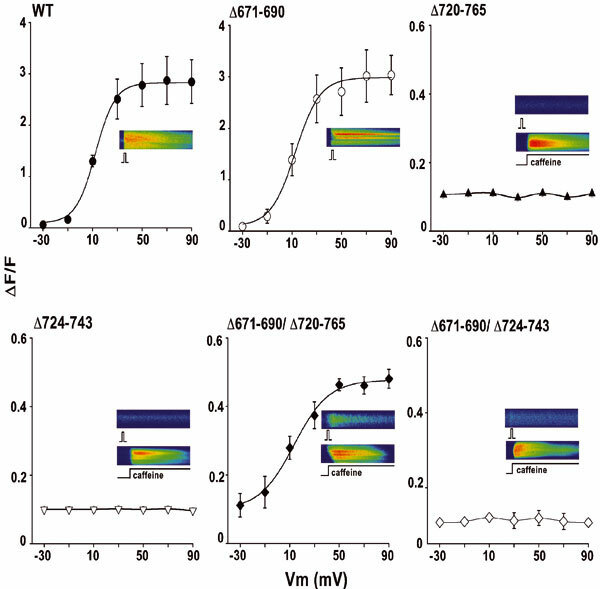 A conserved heptad repeat is present in voltage-gated K+, Na+, and L-type Ca2+ channels in the S4-S5 cytosolic linker immediately following the S4 charges. In the Shaker K+ channel, alanine substitutions in the heptad repeat leads to large positive shifts in the conductance vs. voltage curve (McCormack et al., 1991; Bezanilla, 2000). These conductance shifts suggest that the S4 heptad repeat might be critical for the tight coupling that exists in voltage-gated channels between movements of the voltage sensor and the opening of the pore. Perhaps the heptad repeat in the carboxyl terminus of the b subunit could affect the coupling between charge movements in the DHPR voltage sensor and opening of the RyR1 channel. Figure 3. Sigmoidal and bell-shaped voltage dependencies of Ca2+ transients in b1 KO myotubes expressing truncated b variants (from Sheridan et al., 2003a). Ca2+ transients were triggered by depolarization of 50 ms (filled symbols) and 200 ms (empty symbols) from a holding potential of -40 mV. Constructs are identified by the number of deleted residues counting from the carboxyl terminus. b2-b1 correspond to a parent chimera with full-length carboxyl terminus and full skeletal-type phenotype from which the serial truncations were made. The longer depolarization increases Ca2+ entry into the cell, which promotes Ca2+-dependent SR Ca2+ release and bell-shaped fluorescence vs. voltage relationships in the truncated mutants. Drastic changes in EC coupling were reported when a1S, the skeletal pore isoform, was replaced by a1C, the cardiac pore isoform, in the cellular context of a primary dysgenic a1S-null skeletal myotube (Tanabe et al., 1990). The Ca2+ fluorescence vs. voltage curve expressed by a1C in dysgenic myotubes had a maximum at ~+30 mV followed by a continuous decrease at more positive potentials. The biphasic nature of this relationship, together with a dependence of Ca2+ transients on external Ca2+, showed that Ca2+ dependent EC coupling could be implemented in skeletal myotubes by a hybrid DHPR composed of a cardiac pore subunit and skeletal non-pore subunits. Likewise, elimination of the D5 region of DHPR b1a, in the context of a skeletal myotube lacking b1 but expressing wild-type a1S, changed the EC coupling trigger signal in a manner similar to the change observed when a1C replaced a1S (Fig. 4). The similar outcome of these two sets of experiments, namely a1S replacement by a1C vs. b1a replacement by b2a, can only mean that both subunits have entirely analogous function and that, most likely, the a1S/b1a pair, and not either subunit alone, controls the EC coupling signal in skeletal myotubes. This suggestion is strongly supported by the fact that the minimal structural and functional unit of the L-type Ca2+ channel is the a1/b pair (Tareilus et al., 1997; De Waard et al., 1994). Figure 4. Summary of voltage-dependence of Ca2+ transient in dysgenic mdg myotubes (from Ahern et al., 2001c; and Carbonneau et al., 2003) and in b1 KO myotubes (from Sheridan et al., 2003a,b). Cytosolic fluo-4 Ca2+ fluorescence acquired by confocal microscopy and voltage-clamp are shown for dysgenic mdg myotubes expressing the skeletal DHPR pore variant a1S, the cardiac variant a1C, and a1S lacking the two identified II-III loop domains involved in EC coupling (D671-691/D720-765). Fluorescence curves are shown for b1 KO myotubes expressing the skeletal DHPR variant b1a, the cardiac variant b2a, and the skeletal variant lacking the carboxyl terminus domain (D60). Lower traces according to the y-scale on the right. It is also important to point out that although the fluorescence signal generated by D671-690/D720-765 is small, this result cannot be taken as an argument favoring the notion that the bulk of the EC coupling is initiated by the II-III loop and that a minor component is initiated outside of the II-III loop. Fig. 4 shows that ~80% of the EC coupling fluorescence signal can also be eliminated, under conditions of normal charge movement, by deletions of the DHPR b1a subunit carboxyl terminus in the context of an otherwise wild-type DHPR. Hence, the output signal leaving the DHPR receives contributions from more than one subunit and, by nature, is non-additive. The relative contribution of different DHPR domains to the EC coupling signal transmitted to RyR1 is a challenging issue that needs to be addressed in the future. Supported by the National Institutes of Health Grants AR46448, HL47053, predoctoral fellowships from the American Heart Association Wisconsin Affiliate to D.C.S. and C.A.A, and by predoctoral fellowships from the National Institutes of Health Training Grant T32 HL07936 to C.A.A and L.C. Received: January 21, 2004. Accepted: March 19, 2004.